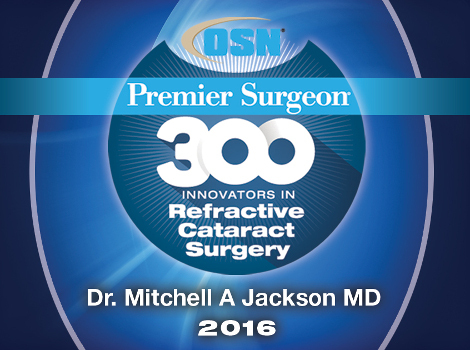 Dr. Mitchell A Jackson, top rated Chicago cataract surgeon, utilizes advanced laser assisted technology to make cataract removal safe, fast, and painless. Dr. Jackson has performed over 22,000 cataract surgeries and provides his expertise in selecting Custom-tailored Cataract techniques and Premium Multifocal Lens technologies. He has been recognized nationally and internationally for his work, and continues to explore the latest developments in technology and technique to provide their patients with the best possible outcomes. In order to deliver the best possible outcome for cataract procedures, we offer custom laser cataract surgery. This is just one of the many ways we strive to provide you with the highest quality eye care services available. At Jacksoneye, we understand that using the most advanced technology on the market will significantly impact the results of your procedure. In addition, JacksonEye makes the cost of cataract treatment easier than ever with great financing options through our credit partners. Call or visit today to get started!